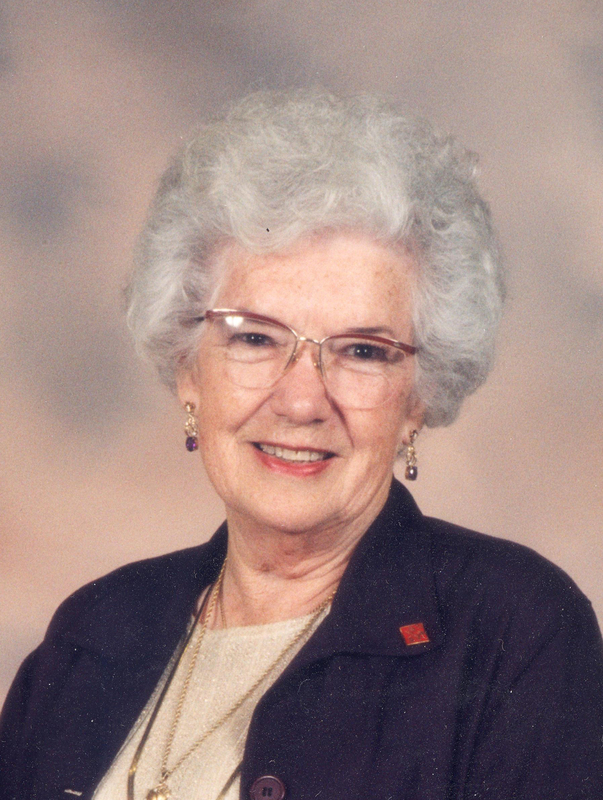 Mildred Bonnie Moore Jensen, 98, passed away April 8, 2019. She was born Sept. 22, 1920, at the Sawyer Ranch, located on the outskirts of Susanville, Lassen County, California. She was the daughter of Benjamin Franklin (Frank) and Ada Irene Hamilton Moore. Her early life was spent in Oregon and Washington, where her father worked as an automobile mechanic. Her only sibling, her sister, Lois Moore Failor of Price, Utah, predeceased her. On Aug. 28, 1954, she married her sweetheart, Donald Moroni Jensen. The ceremony was performed by Donald’s father, Alma Moroni Jensen, at the Jensen home in Richfield, Utah. On Sept. 12, 1958, their marriage was solemnized in the Los Angeles, California Temple of The Church of Jesus Christ of Latter-day Saints. Donald died on Feb. 17, 1993. She received her first two years of schooling in Tacoma, Washington. For the next five years, her education was spread over schools in Ely, Nevada, a one-room schoolhouse in Pleasant Valley, Nevada, and Longfellow School in Salt Lake City, Utah. She attended Bryant Junior High School, Roosevelt Junior High School, and graduated from East High School. She received a degree from LDS Business College, earned a certificate in Business Administration from the University of Utah and received her Utah State Cosmetology license after completing course work at Hollywood College in Salt Lake City. This latter accomplishment was done as a hobby, since her expertise and interest lay in business administration. Education was an ongoing endeavor in her life and she regularly attended extensions and evening classes at the University of Utah and BYU classes at the McCune Mansion in Salt Lake City. Business workshops, seminars and training sessions were attended throughout her business career. In May 1940, she started her business career as steno-clerk in the sales and advertising department at Mountain Fuel Supply Company in Salt Lake City. Her 42-year business career was spent at Mountain Fuel Supply Company (now Questar Corp) where she progressed through the various stages of responsibility. In March 1982, she retired from Mountain Fuel Supply Company. At the time of retirement, she held the position of corporate secretary of Mountain Fuel Supply Company and assistant to the chairman of the board. She served as corporate secretary to Mountain Fuel Supply Company subsidiaries – Entrada Industries Inc., Wexpro Company, Mountain Fuel Resources Inc. and Interstate Brick Company. Her business affiliations included being a member of the Pacific Coast Gas Association, board of National Notebook Committee. She served as a board member and chairman of the board of Junior Achievement of Greater Salt Lake, board member of the Salt Lake Area Chamber of Commerce, and board member of United Way of Greater Salt Lake. She was a member of the American Association of Corporate Secretaries and served on a national judging committee for the selection of Secretary of the Year. Among her business achievements were a Silver Award for chairmanship of a Pacific Coast Gas Association national workshop; honorary association of arts degree from College of Eastern Utah and National Business Leadership Award given by Junior Achievement Inc. In civic activities, she served as chairman for two Giant in Our City Banquets for the Salt Lake Area Chamber of Commerce; member of the committee for the dinner honoring the president of The Church of Jesus Christ of Latter-day Saints, President Spencer W. Kimball, on his 80th birthday, where she had the responsibility for invitations and reserved seating for guests; arrangements chairman for the 1980 annual meeting of the Pacific Coast Gas Association held in Salt Lake City. A sought-after fundraiser for good causes, she headed winning teams in raising funds for Junior Achievement, United Way of Greater Salt Lake, the Utah symphony and the Utah Opera Guild. After her retirement and move to Rockville, Utah, she served as a member of the Rockville Beautification Committee and served a total of 14 years as a member of the board of directors of Zion National History Association, including one terms as vice chairman. An active member of The Church of Jesus Christ of Latter-day Saints, she held a variety of Stake and Ward positions. Of all her callings, she considered being a teacher as the most challenging, rewarding and the one carrying the most responsibility. She and Donald loved to travel. They saw the West with a tent for sleeping and finally with a travel trailer. They camped and fished, hiked and photographed their many destinations. Their vacations were spent traveling by car all over America and most of Canada. By air and by boat, they visited Hawaii, Alaska, the Virgin Islands, Mexico, British Columbia and Nova Scotia. They purchased a condominium in St. George with the intentions of spending the winters in St. George and the summers in Salt Lake City. After Mildred’s retirement, memories of the beauty and tranquility of Zion Canyon brought them to Rockville, where they bought their farm and decided to make Rockville their home. They spent many happy hours in Zion National Park, enjoying the river views and the awe-inspiring scenery. They made many wonderful friends in the area and the years spent in Utah’s Dixie were some of the happiest ones they shared. Mildred and Donald had no children, but they loved their nieces and nephews as if they were their own and Mildred considered as her daughters some very special young women who worked with her at Mountain Fuel: Sandy Burgess, Pat Pinder, Pat Naisbit and Sheral Hamada are the dearest of many she associated with over the years. Mildred was preceded in death by her mother and stepfather, Harry E. Cloys; her father; her husband; sister; and nephews Douglas Jensen and Roger Halterman. Her survivors are her beloved nieces: Jody Trujillo of Aledo, Texas, Dawna (Joe) Priano of Sandy, Utah, Judy Halterman, Janet (Dr. James) Simmons, Jayne (Jim) Perlinski all of Bozeman, Montana; and her beloved nephews Jeff (Julie) Failor of Wellington, Utah, Wayne Jensen of Henderson, Nevada, Bartell (Arlene) Jensen of Logan, Utah, and Ron Jensen of Spokane, Washington. Funeral services will be held Monday, April 15, at 11 a.m. in the Virgin River Ward Chapel, 1584 Zion Park Blvd., Springdale, Utah. A visitation will be held Monday, prior to services, from 9:30-10:30 a.m. at the church. Graveside services will be held Tuesday, April 16, at noon in the Salt Lake City Cemetery. Arrangements have been entrusted to the care of Metcalf Mortuary, 435-673-4221. For condolences, full obituary and funeral listings please visit Metcalf Mortuary online.